Yes, the view is the same, BUT, the experience is totally different from the front seat of your very own Jeep® Wrangler Rubicon! At Quasar Expeditions, we want to offer you the best and most unique ways to explore the wonders of this wild and jaw-dropping landscape. So, we’ve partnered with Jeep® to offer you a flexible and adventurous way to experience Patagonia as it should be seen; privately, intimately and spectacularly! When we hand you the keys to your Jeep® Wrangler Unlimited Rubicon, we’re not only offering you a vehicle to get from A to B. We’re setting you up with everything you need to truly experience Patagonia’s rugged and remarkable landscape! This includes expedition manuals, a top-of-the-line navigation system, satellite tracking and your own satellite phone. Even though you are in one of the most remote areas on the planet, you have the assistance and support 24/7 from our ground team in Patagonia. Driving in Patagonia, you’ll experience the full spectrum of terrains! From paved, main roads to dirt, loose gravel and uneven ground, the powerful Wrangler 3.6L Pentastar® V6 engine has plenty of grunt and torque to take you wherever you want to go! With advanced safety features and superb off-road capabilities, you’ll also be well-equipped to handle Patagonia’s unpredictable climate. Sun, rain, wind or snow, Jeeps® capability will help to make sure nothing stops you from going that extra mile off the beaten path. And, don’t forget fuel efficiency! Jeep® is rated at 17 miles per gallon in the city and 21 miles per gallon rating on the highway so you won’t need to spend a fortune on gas either! The Jeep® Wrangler Rubicon comfortably seats up to 4 adults and 1 child under 12. There’s plenty of trunk space for your luggage too, with about 46 cubic feet of space behind the back seats. If you’re traveling in a larger group, simply reserve multiple Jeeps! This will also give you the added flexibility to take separate side-trips to please everyone. We also provide you with handy VHF radios to communicate between vehicles while on the road. All of our Quasar Jeeps® are equipped with on-board Garmin® navigation systems. These are pre-programmed with your route, destinations and hotels so you never get lost, even if you’ve chosen a self-drive option. Each vehicle is also fitted with its own iPad, that has a custom-built APP that will have your personalized itinerary on it. The App will also include a multi-media system that acts as your very own tour guide, highlighting points of interest and playing informational videos along the way so you can get the most from your journey. You’ll also be able to use local guides throughout your safari who can direct you through a range of different side-excursions. Cooler filled with drinks and snacks for the week. Using our local knowledge, we’ve crafted 2 Jeep® safari itineraries that’ll take you to bucket list destinations throughout Patagonia! Spend 6 days exploring Chile’s Torres del Paine National Park or take 9 days to add in Argentina’s Los Glaciares National Park, including the mighty Perito Moreno Glacier. Both options will have you driving through majestic valleys, hiking among granite horns and towers and kayaking or fly fishing in pristine alpine lakes. With a guide in your Jeep®. With a guide in an accompanying Jeep®. Self-drive with support from our Patagonia team. Regardless of which option you choose, Jeeps® legendary power and capability is by far the best way to truly experience this ‘go anywhere, do anything’ adventure. You don’t need to sacrifice luxury, comfort or style to satisfy your adventurous soul – do both, choose Jeep®. 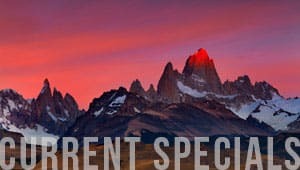 To help even more with your decision on a Jeep vs renting a car in Patagonia, below are links to even more reasons why a Jeep is your best choice! Read about Men’s Journal writer, Matt Bell’s experience on our 8-day self-guided Wild Patagonia excursion here. Then, start planning your overland Jeep exploration of the Land of Giants by heading to our Overland Safaris page. ----> Patagonia Overland Safaris.